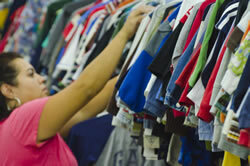 Our volunteer workers are a crucial and vital part of the success of Kid's Market and Mom. Along with the advantage of shopping early, as a worker you will also enjoy the benefits of developing life long friendships. We welcome husbands to work and children are allowed to work beginning at the age of 10. Listed below are requirements and benefits. After reading this information, you can go here to sign up for Prom and Pageant Sale Worker's Hours to find out what hours are available. You can go to here to sign up for the Spring and Summer Sale Worker's Hours to find out what hours are available. View the schedule and signup here. Prom and Pageant Worker's Hours to find out what hours are available. Spring and Summer Worker's Hours to find out what hours are available. You must work 10 hours PLUS mandatory sorting (a 6 hour maximum process). There is also a 20 hour option for veteran workers, you must have had worked a prior sale to qualify. You are required to clock in and clock out of each of your shifts so that your hours can be tracked. You qualify to shop first, even before the consignors shop. You qualify to shop the 50% discount sale prior to the public. You will be served a meal compliments of Kid's Market during your shopping time. No standing in line for a priority number. You can find the highest quality items at the best possible price from a huge inventory available at the beginning of the sale. Snacks and drinks are available for a minimum charge. We also have a refrigerator available if you bring your own food or drinks. Security is provided during working hours. Your work schedule is very flexible. You can work your entire shift in one day or as many days as you need. "It is a blessing to my family." "I would rather work at Kid's Market than work my regular job." "I worked when my children were little, now I am working for my grandchildren." "I have met my best friends here, not only do we shop Kid's Market together, we now do other activities together outside of Kid's Market and Mom."